Finally Mr. Bronsolino's freshest Album on Vinyl!!! 2015’s Mr. 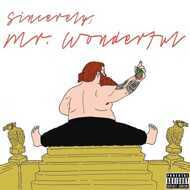 Wonderful is a culmination of every ingredient that's made his discography delectable, then taken levels higher. The musicality is grade A; live instrumentation turns Mr. Wonderful into a wonderland of sonic discovery. "A Light In The Addict," featuring Party Supplies and Fools Gold vocalist Black Atlass, and "City Boy Blues," which boasts the bottom production of 88 Keys and top coating of Party Supplies, both soar with gorgeous orchestration. The latter track in such a zone that Bronson doesn't spit a single bar, instead letting his vocals ride the wave of soulful rock. Action Bronson feat. Chance The Rapper - Baby Blue from Swell Music + Sound on Vimeo.